Measure twice and cut once is a well-known phrase among surgeons, but this is not always what happens. To better prepare new surgeons for the operating room, University of Houston (UH) computer scientists are working with medical researchers at the Methodist Institute for Technology, Innovation and Education (MITIE) to improve existing training processes. At the core of their effort is understanding the role of stress on a surgeon's path to competency. Ioannis Pavlidis, director of the Computational Physiology Laboratory at UH, Dr. Barbara Bass, chair of the department of surgery at The Methodist Hospital, and their colleagues describe their findings in a paper titled "Fast by Nature  How Stress Patterns Define Human Experience and Performance in Dexterous Tasks." The article appears in Scientific Reports, the new open-access research publication from the Nature Publishing Group. The group recently completed a three-year study funded by the National Science Foundation (NSF) that measured the stress levels of physicians during surgical training. In addition to the $500,000 from NSF, the researchers received a $200,000 grant from the John F. and Carolyn Bookout Fund to supplement the study. Pavlidis and his colleagues developed a non-contact method of measuring stress and the body's response to threats or challenges. This new thermal imaging method is capable of quantifying performance and physiological stress indicators by measuring facial perspiration, revealing how a person reacts to a threatening situation. This is called a sympathetic response. Pavlidis, Bass and their teams were able to monitor these sympathetic responses of 17 surgeons  10 experienced and 7 novices  while engaged in laparoscopic surgical training over the course of several months. Bass, an authority in surgical education and director of MITIE, had long recognized that surgeons in training exhibit stress as they learn to perform surgical procedures. The team hypothesized this stress could be measured using the thermal facial mapping technology developed by the Pavlidis research laboratory and set out to determine if facial thermal stress would correlate with surgical skill performance. "We found that regardless of experience level, surgeons attempt to perform tasks at the same speed," Pavlidis said. "This is counterintuitive, because you would expect common sense to tell a novice to be more careful and slow down in an effort to reduce errors. This was not the case in our study. Instead, the novices attempted the tool transferring, cutting and suturing tasks as fast as the experienced surgeons, thereby making many more errors due to their lack of experience to accommodate such speed." This led Pavlidis and his colleagues to question why this was the case, and they discovered that high stress levels in novices were the likely trigger of fast behavior. When presented with a challenging task, he said, the basic human instinct of survival mode kicked in precipitating action, even if the speed of that action was counterproductive for the desired result. "While we hypothesized that stress is a factor in surgical training, we were not aware of the impact of stress on the learning process," Bass said. "This behavioral pattern and its cause were well hidden, because until recently, objective stress measurements in natural settings were difficult. Even if such measurements were feasible, educators would not likely have made the connection since current metrics for skill acquisition are often based on the time required to execute a task. The results of this study suggest that we rethink our philosophy of training to an endpoint that includes speed, as opposed to stressing precision in skill development, even if the pace of skill execution is deliberately slowed." With this knowledge, Bass, Pavlidis and their colleagues strive to change the current standards of surgical training that grade only on time and error performance without taking "nerves" into account. Incorporating the testing of physiological reactions into the process would reveal whether surgeons have truly stopped internalizing the fear despite the dexterity they are able to exhibit externally in current training evaluation methods. "Our goal is for surgical training to go beyond just measuring time and errors at face value," Pavlidis said. "Instead, we also must look at the sympathetic responses that are the telltale sign of whether a surgeon is in control of his or her anxiety with the task at hand and ready to move beyond simulated surgeries and be trusted with human patients." The key, the researchers believe, is to reduce stress levels in the initial stages of training. Reduction of stress may result in reduction of attempt pace and consequent reduction of errors. 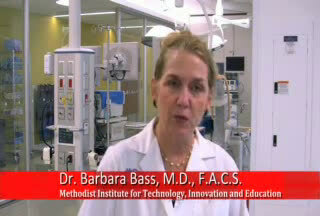 "Surgeons have long considered speed to be a metric for efficiency in surgery," Bass said. "However, this study demonstrates that speed during skill acquisition is, in fact, a counterproductive metric and one that may need to be specifically interrupted to enhance training efficiency." It is likely a broad problem, Pavlidis says, with stress appearing to interfere with the skill acquisition process in general. Therefore, a future area he'd like to pursue is finding a way to reduce stress that would allow novices across a variety of professions to attempt tasks at speeds more commensurate with their experience. He says if trainees could just slow down, then it may shorten the training time and enhance their experience. Lasting more than three years, this multidisciplinary effort included surgeons, computer scientists, engineers and statisticians. In addition to Pavlidis and Bass, key contributors included Panagiotis Tsiamyrtzis from the department of statistics at Athens University of Economics and Business; Dvijesh Shastri, Avinash Wesley, Yan Zhou, Peggy Lindner, Pradeep Buddharaju and Anitha Mandapati from UH; and Drs. Rohan Joseph and Brian Dunkin from MITIE.